^ Dominguez, Pier (2002). 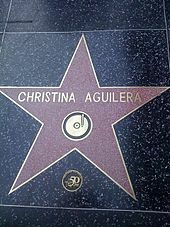 Christina Aguilera: A Star is Made: The Unauthorized Biography. Amber Books. ISBN 0-9702224-5-9. ^ Christina Aguilera: Artist Singles Chart History. Billboard magazine. [2006-10-20]. "Stitch by Stitch" · "I Believe I Can Fly" · "Cry" · "Born to Fly" · "Tumbling Down" · "Set Fire to the Rain" · "My Baby's Got a Smile on Her Face"